Yellow is vibrant color that is most often used to represent happiness and energy. Therefore, a yellow wedding theme is an obvious choice for couples that want a long and happy marriage. Yellow is a very bright color, it brings life to whatever environment it is in, and is perfect for setting the mood for a joyous occasion. 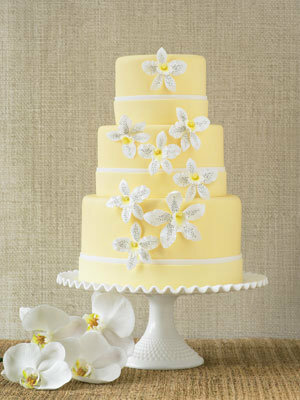 The best times of the year to use a yellow wedding theme is during the spring and summer months. This color can be used to celebrate the warm weather and new beginnings. Light pastel yellows are ideal for spring while bright and bold yellows are the perfect shades for summer. The lighter shades of yellow look great with other pale colors such as light pink, white or silver. The darker shades of yellow adds a great contrast to colors like black, brown and lighter shades of yellow. Yellow can be worn in a number of different ways by the bride. A light yellow dress would be a good substitute for the classic white wedding gown. Or there may be white dresses with yellow embroidery or embellishments that will be perfect for this theme. If the wedding is casual and set in a garden, the bride can add a lovely yellow flower to her hair as an accessory. Since yellow is a fairly popular color, the rest of the wedding party will have no problem finding an ideal ensemble look. 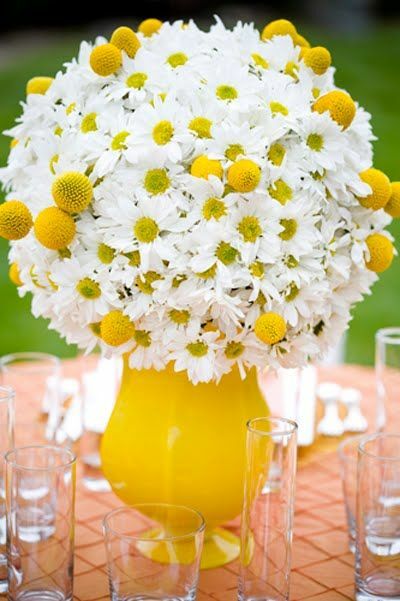 There are a lot of beautiful yellow flowers that can be used as part of the bridal bouquet or centerpiece. Flowers that are recommended for a yellow wedding theme include ranunculus, daisies, roses, tulips, orchids and calla lilies. They would look amazing combined with other flowers that are either white, red, orange or pink. You can also choose to have a simple bouquet of just one kind of yellow flower tied together with a ribbon of another color. This will look just as stunning against a pure white wedding gown. Yellow is an uplifting color, but it can also be a little overpowering so the key to successfully creating your yellow wedding theme is to have just the right amount of yellow. Too much of this color and it becomes too visually stimulating. Make sure to combine your yellow decorations with some other colors, preferably ones that are a little more muted like white. Having a wedding cake that incorporates both colors can be great, white makes it more elegant while yellow adds a bit of fun. Since you will most likely have this theme in the spring or summer, it's the perfect opportunity to take advantage of some of the fresh yellow fruits and vegetables that are in season. Serve you guests dishes that include yellow bell peppers, yellow squashes or yellow zucchinis. You can also create some fun beverages by adding bananas, pineapples and lemons. You can even think about using the fruits as part of the centerpiece that goes on the reception tables. Using the color yellow in this way really helps to make your wedding more lively and carefree.